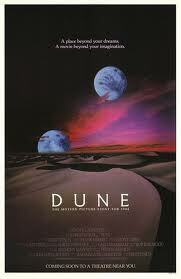 Today’s book is Dune by Frank Hebert. Dune is one of those books that I have meant to read for a long time. Since I was a child I could remember my mother’s tattered original copy sitting in the bookshelves and every once in a while I would pick it up and try to read it and I would get overwhelmed. Two summers ago a friend who was road-tripping with me was reading it and enjoying it, and I picked up a copy and tried to read it again– this time I got distracted by other things in life and didn’t finish. So finally, I picked it up again (for the third time now) and read it, and this time, I finished. Okay, confused already? Well, Dune is a dense book filled with treachery and scheming. The characters, while not unsympathetic, are not wholly good or evil. Most of them inhabit different shades of grey and Paul is not a wholly likeable hero. He is not necessarily noble and good- he understands that he is unleashing war and seems to accept it as his fate. The book as a whole is deeply complicated and my guess is that it will take multiple readings to pick away at the layers. The religion that Herbert constructs, the customs and society- all of it — is really very intricate. A few comments about the book– first of all I liked the way Herbert portrayed the female characters. They are fighters, warrior women, wise-women and lovers. No wallflowers here– they do not sit back and watch the action, but rather they are integral to the action. This I found refreshing and progressive especially given that this book was written in 1965. Secondly, I think the book can be read in many ways, but one possible way, is as an allegory to the Middle East and the problem of oil (the “spice” in the novel) and how the nobles (dictators, or kings) oppress the freman (tribal peoples, ordinary people) who follow a strict religion (Islam.) I don’t think this is at all a big stretch- but I also think that Hebert leaves it open as to what he is saying with this book. Power corrupts– power goes to men’s head, and power is deadly– Hebert shows that clearly in this work. And I cannot even begin to start with the issues of ecology that Hebert deals with in the book. Let’s just say that this book is as relevant now as it was when first published. This book is not for the young. Frankly, where I would let teenagers read Tolkien and Le Guin, I think that Herbert’s work is better read as an adult. For one it is more personally bloody (the knifefights!) secondly, I think it might just be too overwhelming– especially grasping the religious meanings, which are intricate and difficult. Herbert’s book is a masterpiece, and what I can say here doesn’t scratch the surface. It’s a heady book, brilliantly conceived and an amazing treatise on the condition of mankind. It’s not about good vs evil, or truth vs. untruth– it is murkier and darker than that, and in that way, it is more true to the human condition. 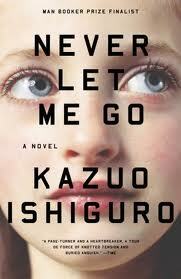 Today’s book is Never Let Me Go by Kazuo Ishiguro. Ishiguro is one of Britain’s great living writers and I had heard from many people that I should read this book. So I picked it up earlier this week and settled into one of the more eerie, haunting reads of recent memory. Never Let Me Go is a study in subtlety. Ishiguro unfurls the story carefully, slowly, in an almost elegatic tone. At its most surface level the story is about three friends, Kathy, Ruth and Tommy, who start off as students in a boarding school, called Hailsham. But right away, you get the sense that this school is no normal school. As Kathy narrates, she notes that she has spent her adult life as a “carer” of “donors” and that eventually all “carers” become “donors.” You get a sense that something is not quite right, but Ishiguro explains this (or shall I say he doesn’t explain it- he leaves the readers to infer it) slowly, carefully– through Kathy we glimpse a world that is strange but also idyllic with children spending hours on art projects, with “guardians” not teachers– and with the itty-bitty infighting that characterizes teenage cliques–the mundane, banal aspects of human life. Except these children are actually “students” and they are not really human– they are clones that are nurtured to grow up, and die young as their organs are harvested to prolong the lives of “normals”. You have no sense of the scientists that engineer this horror show, or the outside society that shuns the “students.” Instead, you realize that the students willingly go along with the plan–there seems to be nothing to force them towards their fates, except their own resigned will. In this way, the book could be classified as sci-fi, but it has none of the traditional trappings of the genre. Instead it is more like a measured study of a dystopian reality– an alternate Britain, that scarily does not look a whole lot different from the world that we currently inhabit. There is more to the book- especially to the dynamic of the three friends, Ruth the imaginative and pushy, Tommy who is shyer, but prone to fits of temper, and the narrator Kathy’s measured calm- in fact her very voice is distinctive and unnerving, but she is our guide for the journey. There is so much more, but I will not say more about the actual plot, except that it quietly, unnerves you. Ishiguro is a master of understatement- a master of leaving the reader to infer what it is he really means. He trusts that you will figure out what is going on for yourself, he trusts that you will take something away from the book. So what is the book really about? In one sense, it warns us of the dangers of science going amuck–or as my father says “Of man playing God” but that is really the most surface understanding of the book. The way I saw Never Let Me Go is that it was really a meditation on hopelessness, morality, repression and the darkness of the human soul. Ishiguro peels away at the reader’s assumptions and feelings, until you are there, at the end, standing with Kathy in the grey field, feeling the cold, bleakness of it all. If this sounds grim, then perhaps it is, but this book is deeply affecting and moving– it leaves you unsettled, trying to sift through all the hidden meaning and pain that you are so carefully and subtly confronted with. It is a book that will stay with you for a long time, to ponder and wonder.